2/24 - JDD "What's the difference between lo mein and chow mein, and why isn't there a high mein?" Our Daley vacation to Washington, DC fits in here, but I'll post my notes on that separately. 2/26 - I do not usually post my children's prayers, because they are so personal. But this one was so beautiful and simple - a true example of the childlikeness that Jesus wants us to have, that I think it will be a blessing to share it. Joy, praying out loud at dinner for the first time. "Dear God, Love dinner. Amen"
2/26 - And, now in that same dinner the conversation turns to other subjects. JDD, "It's in an annhiliated pile of..." He and Noah finish in unison, "Annhiliation!" 3/3 - Jeremiah rolled off the futon onto the floor. Joy remarked, "Dat was a nice tumble-sault." 3/5 - Joy was tired of not being able to get clean clothes in the morning when our bedroom door was shut. So we moved Faith's clothes around to empty a drawer in their room for Joy. Joy transferred her clothes into her new drawer all by herself. She carefully re-folded everything very neatly, and stacked them into like piles in the drawer. She did the whole operation herself. 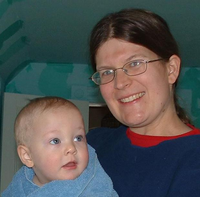 3/6 - It's too quiet and Mom's brain is in too many places: I was working on school with Jonathan and remarked that Jeremiah was being really quiet, I wonder what kind of trouble he's getting himself into. A few minutes more and I can't stand it. I have to go find out what's going on before I have some big disaster to take care of. I start searching, and what do I find? A peacefully sleeping baby on the couch in the living room - exactly where I had put him! 3/6 - Joy showed me that she can climb up to and down from the top bunk all by herself. 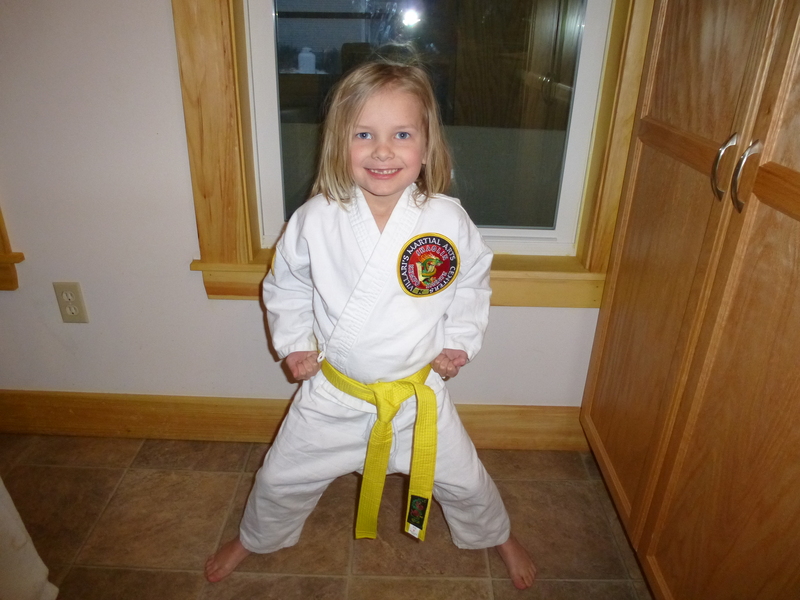 3/8 - Faith got her yellow belt! Her test looked pretty different from the boys', mostly because the class had a higher percentage of younger kids. It was still two hours long, but they did more moving tests - obstacle courses, and moving from station to station to demonstrate their knowledge, and not so much holding one position for a long time. They did do the meditation position at the end for a long time, though, and we (the parents) were wondering if a couple of them were sleeping. 3/10 - Jeremiah looked in the open door of the broom closet, saw the broom, reached out for it and said, "Ah! I get that" and started sweeping the dining room. Some time before that, he was playing Legos with Jonathan and picked up a piece and said, "Ooh, what's this?" 3/11 - He said "up" quite distinctly a couple of times, and "nan" for banana. 3/12 - Joy and I were discussing her age. She remarked, "When I two a half, then I little." 3/17 - Jeremiah knows how to bring a step stool somewhere so he can reach higher. Ack! 3/20 - Jeremiah climbed down the stairs from halfway. 3/21 - Noah read the dijon mustard label as "digital mustard". Ah, what a nice Sabbath present! Great stories from each child. Of course Joy knows she is no longer "little." She was telling me with evident pride that she is now big enough to have her own chores and her own "chore pack." She may not always enjoy doing those chores, but she knows they're a sign of maturity. And so, obviously, does Jeremiah! Question: Did the boys actually pronounce the word as "annhiliation," or did you make a double misspelling (very unusual for you, which is why I ask)? Oops, a true misspelling from me! I think it was just a typo, but all those i's and l's clump together and I didn't notice the extra i until you pointed it out. Jeremiah has been climbing all the way down the stairs the last couple days - I didn't know that was a new thing - so I sometimes find him at the top of the stairs or halfway down complaining, and I tell him that he can do it, and then he does.